BAGAN Sungai Sembilang is a small sparsely populated coastal fishing village a kilometre south of the more popular Pantai Remis on the west coast of Selangor, near Kuala Selangor. 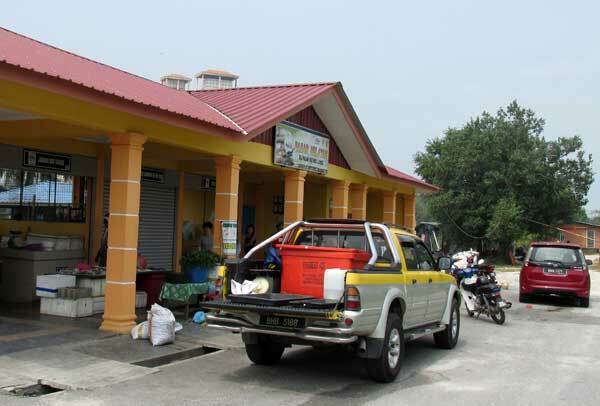 It is accessible via Klang from the south or the Latar highway from the north, off the coastal Kapar-Kuala Selangor trunk road. I found this up-and-coming holiday spot quite by chance while exploring the area. The cluster of casuarina trees that were planted years ago on this stretch were a sight to behold the morning I was there. Their silhouette cast on the white sandy beach made the scenery picture-perfect. Bagan (or Kampung) Sungai Sembilang got its name from the river that runs through the area, which is also used by fishermen to advance inland by water. According to my friend Radzi, the coastal waters used to be teeming with the marine catfish known in Malay as sembilang. They are still found here but not as many as in years past. 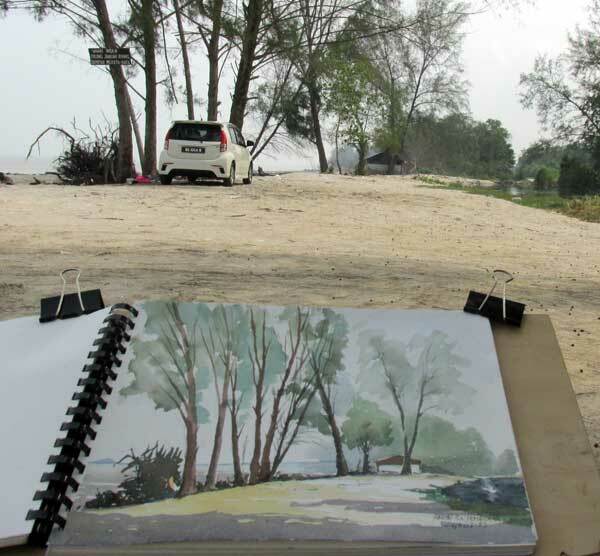 While painting this scenery, I noticed that many of the casuarina trees had been uprooted. Their trunks had been sawn off and the stumps left to rot. According to an army veteran (who watched me paint), the water-line was farther out at sea. "There were even more trees those days but over the years, the sea claimed more land," he explained as he pointed to a line of rocks that ran parallel to the beach, 50 metres away. "Those are what remain of a sea wall built many years ago to prevent erosion and they are now submerged in mud. Who knows, one day, the area where we are standing now might be under water." This stretch of beach is relatively unknown and is usually deserted on weekdays though there are some makeshift huts built some time ago. Come weekends or holidays, the shady stretch under the casu arinas will be occupied by cars. The beach is relatively clean, thanks to "No Littering" reminders nailed onto the trees by the locals, a troop of macaques were at the beach the day I was there. I saw about 10 of them scouring the ground for food scraps. 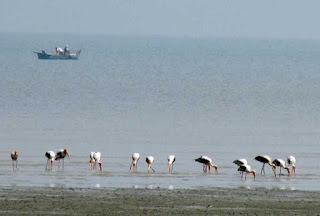 The tide goes far out in the mornings, I was told, and the exposed mudflat is often filled with wading birds. 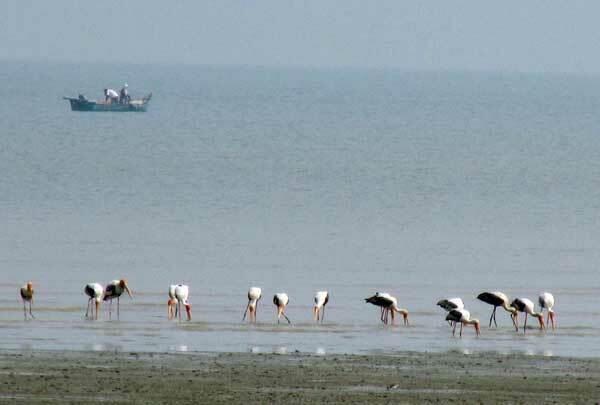 The day I was there, a huge flock of painted storks and a couple of Lesser Adjutants were spotted foraging in the shallows, picking at morsels of food stuck between the barnacle-ridden rocks. Several weekenders were also seen looking for gerimis, a small yellow-brown coloured bivalve that gave the neighbouring Pantai Remis its name. Oysters have also been found here. But if you are not keen on looking for your own fresh seafood, you may want to check out the two eating stalls nearby. There are several holiday homes here, including a boutique resort. A shout's distance away is the wet market run by the fishermen of Bagan Sungai Sembilang. There are two or three fish and vegetable stalls at this market, which sits on the banks of the Sungai Sembilang. If you are looking for fresh fish or bivalves, this is a good place to visit. The prices are not much of a bargain if compared to elsewhere along the coast but the freshness of the sea produce is undoubtedly very good as testified by the number of cars waiting for fishermen to land their catch. The boats moored along both sides of the riverbanks also make for good photography, especially in the evenings. Just a stone's throw from the market is a marine fishing pay-pond. If you are itching to wet your lines and want to score some bragging rights, you can try your luck here for a fee. Sungai Sembilang lies a short distance off the Kuala Selangor-Kapar trunk road. If you are coming in from the south, Klang, keep a look out for the Petronas Sungai Sembilang fuel station. Turn left at the road a few metres after this station. The road is named Jalan Pantai Sungai Sembilang. If you miss this, the next road to watch out for is Jalan Khailani, just a few metres from Jalan Pantai Sungai Sembilang. Just go straight and you will first come to the Bagan Sungai Sembilang wet market. The road to the beach is at right of the wet market which sits on the riverbank. If you are using the Latar highway, it is about seven kilometres after the town of Sasaran (or Sungai Buloh, Jeram). The Petronas Sungai Sembilang should be on your right, and the two beach accesses will be just before the Petronas station. You can search the location on Waze or Google Maps.